For those of you who have followed me throughout the years, you know my style has changed a lot overtime. 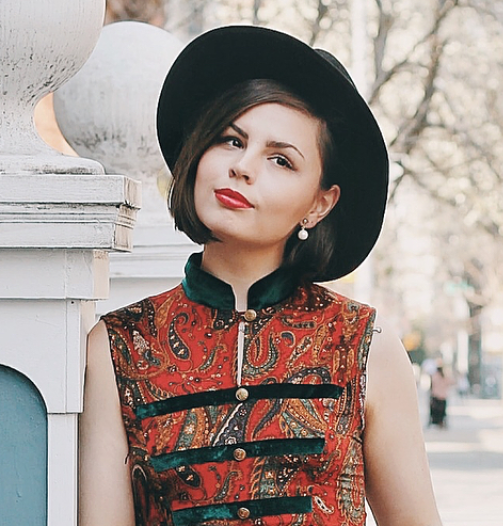 From authentic vintage outfits in high school, to more twee-style dressing in college, it took me awhile to find what exactly my personal style was when I moved to New York. Vintage will always be a part of my style no matter what age I am or where I'm living. Although I enjoy traditional shopping in ready-to-wear stores, nothing gets my heart beating quite like a trip to the thrift store. In the last two years, I've really wanted to start developing a more mature and refined style for myself that is still reflective of my love for vintage, but definitely does have nods to modern style. Living in NYC can be incredibly inspiring to see the world's best fashion right there on the street in front of you, styled by everyday women. It can also be incredibly disheartening because I don't have unlimited budget, and a lot of these fashion-forward pieces may not flatter my best assets. What's a good middle for being inspired, but not letting the inspiration make you feel bad about yourself? With an oversized boyfriend blazer, this look could easily be worn to the office in the morning, then paired down with no jacket in the evening for a dinner date. I'm finally at the point in my life where I understand the need for versatile, multi-use dressing. All those magazine articles I read growing up must have stuck! Hope you all are having a great week so far. If you aren't already, come follow along with my week on Instagram. It's been a busy one so far with three interviews and another one to go tomorrow!